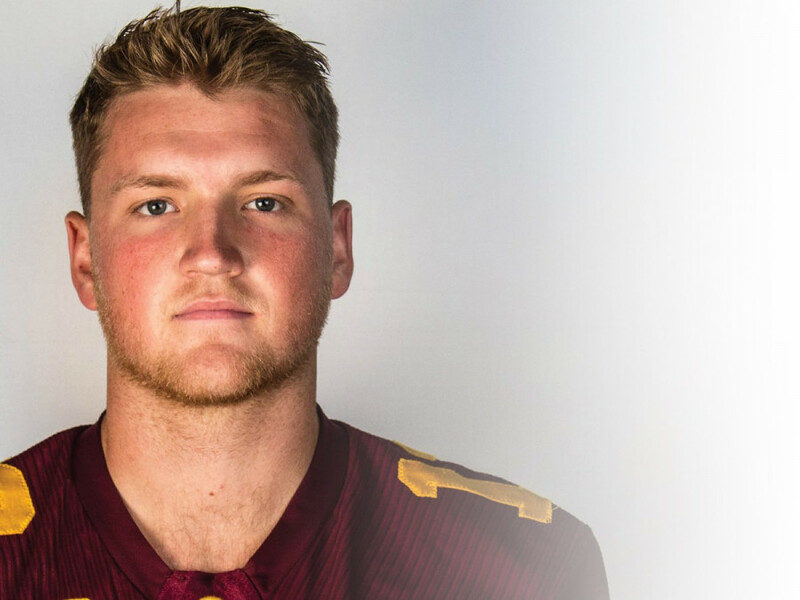 Four weeks into his final year of university football, Concordia’s star quarterback had his career cut short and his future marred by uncertainty. On Sept. 24, 2017, the Concordia Stingers faced off against the Université Laval Rouge et Or in Quebec City. For once, it looked like the Maroon and Gold were going to be able to go toe-to-toe with the conference’s toughest team in a hostile environment. What started as a tense, exciting game for Concordia, quickly turned into a team’s worst nightmare. As Trenton Miller ran down the field, the quarterback took a devastating head-to-head hit from opposing linebacker Gabriel Ouellet. Miller went down immediately. The longer he stayed down, the clearer it became that it wasn’t just pain from a hit keeping him from getting up. From the moment their helmets made contact, Miller knew something was wrong. When he managed to pick himself up off the turf, the only thing he could see was the colour blue. “That’s not right,” he thought, knowing right away he had just suffered a concussion. Miller was out for the remainder of the Réseau du sport étudiant du Québec season and, more importantly, was told by multiple experts that he would never play football again. What followed was a difficult period in Miller’s life. A “weird time,” he described. While the quarterback had dealt with concussions before, finding out that there would be no coming back to the field was a pain that only added to an already difficult recovery period. “When you get hit like that, you’re dealing with the literal changing of your brain chemistry,” said the Buffalo, New York native. He began to feel a change in his mental state. His hormones were off, and Miller began to feel “extreme” changes in his mood. There was little doubt, before all of this, that Miller would play professional football after graduating. His time with the Stingers was nothing short of dominant. Over his three years, Miller played in 19 games, scoring 35 touchdowns, and throwing for 5,735 yards. On top of this, he holds school records for touchdowns (20) and completions (204) in a season in addition to the record for most passing touchdowns in a game (6). The 2015 RSEQ most valuable player had also spent time at professional teams’ training camps. Specifically, that of the local Montreal Alouettes and the Toronto Argonauts. Miller had also been receiving calls from the Canadian Football League and Europe-based teams heading into his final year. In a flash, in one play, all of those possibilities were erased. Over a decade of excellence and hard work put towards what appeared to be a bright, professional future in the game he loved was suddenly out of the cards for Miller. Miller cites sports studies showing that the grief of losing such a major part of one’s life as an athlete is comparable to that of losing a loved one. Miller is looking to the future though. Rather than sitting and brooding over what happened, he’s moved forward with his life. “I think I left Concordia in a better spot than when I came, so that’s rewarding for me and I’m excited to see what they can do moving forward,” said Miller, who spent the rest of the 2017 fall semester finishing his MBA. After earning his degree, Miller moved back to the United States, taking up a job as a pharmaceutical sales oncology specialist in Florida. On and off the football field, work ethic and a good attitude were defining characteristics of the quarterback according to his teammates and coaches. “He’ll be a leader in something,” said coach Matt Connell who sees Miller as the kind of person who will succeed in whichever field he works in. Connell spent plenty of time with Miller as the team’s offensive coordinator and quarterbacks coach. It was Connell and fellow coaches Mickey and Patrick Donovan that preached the kind of passion that inspired Miller to look ahead to his next goal in life. That family mentality and the passion he fostered at Concordia has Miller’s eyes set on a new challenge: Coaching. Perhaps the biggest inspiration for Miller is former coach, Jim Kubiak. A former National Collegiate Athletic Association, Arena Football League, and NFL player, Kubiak may have coached Miller years ago but the two haven’t lost touch. Miller still talks to the former quarterback almost weekly, asking him for advice or using him as a sounding board for ideas. “Seeing how much of an impact he had on my life really stuck with me. He’s definitely an inspiration for that,” said Miller who is hoping he can have the same kind of impact on young players’ lives. When those close to Miller hear that, there’s not a doubt in their minds that he has all the tools he needs to succeed as a coach. Connell noted that Miller’s ambition, work ethic, and high football I.Q are all key tools for any good coach. Adam Vance was Miller’s backup at the beginning of the year. After the game against Laval, it was Vance who started the rest of the year. According to the man who ended up in his position, Miller was nothing but a mentor to him after the injury. As much as he helped teammates by staying around the team, Miller believes his fellow Stingers players did just as much for him. He wanted Concordia to succeed. Miller is confident that he can one day coach at a high level. He’s not only built a strong football resume, but many connections in the coaching world as well. 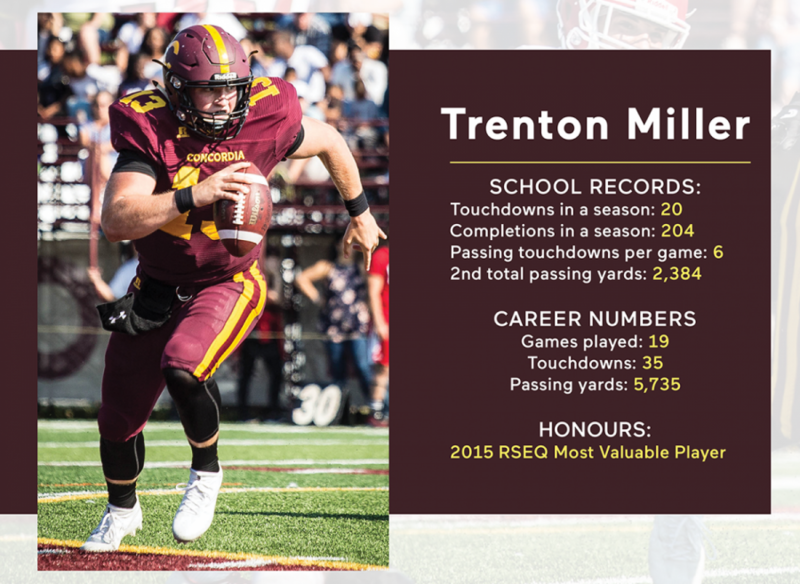 Whether it’s at the high school, NCAA, RSEQ or CFL levels, Miller has spent time with plenty of teams, forming relationships with helpful contacts in the field. Miller isn’t rushing in expecting a university coaching job right away. He knows that you have to learn and move your way up the ladder. That’s just what he’s doing with his quarterback school. In May 2017, Miller started the Next Gen Quarterback Academy. He works with quarterbacks in Montreal from as young as 12 years old, all the way up to the CEGEP level. The academy’s roster of 11 quarterbacks gets plenty of one-on-one time with Miller, who focuses on teaching the technical aspects and specifics of the position. So far, the students are seeing plenty of success with all star team selections and letters of acceptance to top-rated prep schools in the United States to show for it. Vance isn’t surprised at how good of a coach Miller is for his students; he experienced just how good of a teacher he is firsthand. Miller says that the school “keeps his attachment to football alive,” even if he will only gets to coach somewhere down the road. “I would love to be a coach giving the opportunity but you play football your whole life and then it might be good to get away for a few years to reflect and then come back recharged,” said Miller. While running his academy, Miller is working back in the United States, taking some time away from his own football career for the first time since he was a young child. Connell also knows from experience that a player will eventually come to miss the game that they have spent their entire life playing. That’s where coaching comes in. It was Connell’s way back into the game he loves and he expects it will be the same for Miller. Miller is just focused on moving past everything that happened and getting ready for what the future may hold for him.